Crisis is published by Tony Jasper. Material is welcome. Tony.jasper@btinternet.com. Crisis is an on-line magazine reflecting a broad Christian reflection on media and the arts. Advertising subject to approval is available at low cost. Material is welcome from any part of the world. I once spent two hours with Paul Simon, maybe three. I sussed he was lonely encamped in his spacious quarters. We talked everything from religion and Jesus to how the world seems. These subjects remain in his interest span. The International New York Times recently ran the rather splendid head-line: “His ambition never gets old” – how true. This is the artist who originally came to the fore with his mate Art under the name Simon & Garfunkel, and those of a certain age and era will remember such classic songs as ‘Sound of Silence,’ ‘Dangling Conversation’ and “I Am a Rock.’ Christians in particular gravitated to the song ‘Blessed’ with Simon’s lyric building upon the Sermon on the Mount and ultimately the forsaken Christ. There is of old the song ‘7 0’Clock News/Silent Night’ where the traditional carol is sung while a voice reads the news of the death of eight nurses, civil rights injustice, and war casualties and gets louder to overtake the hymn of peace and holiness. Some songs had a degree of religious irreverence, as for instance ‘A Poem on the Underground Wall’ of a man’s lonely quest to write a four-letter terms on a subway wall, but on the track the subway train passing emits a liturgical rhythm and the fugitive handles his writing instrument like prayer beads. For Christians the big moment was in his recording the song ‘Jesus is the Answer’ with the Jessy Dixon Singers that can still be picked up on YouTube or heard on the album Paul Simon in Concert” Live Rhymin’. On this new set you are even more conscious that musically he’s still taking on board what the young are into as in hip-hop or the outpourings of Kanye, still hearing the variances and joys of world music, and collaborating with his long time sound associate Roy Halee, and playing around with so many sounds. 0n this new set four of the first six tracks jettison the guitar , overall percussion gets most honours, and he has no fear that in length the songs often run beyond four minutes. Well, it might be said he has been around long enough with so great a following that he can do what he wishes. And yes for the record production fan there are lovely runs into loops and samples. There is rhythmic handclap and off-beat, so to soundscapes that meld brass and gospel singers, African woodwind, Peruvian drums, and oh, much more. Simon, on the enclosed notes with the CD, speaks of his use and love of Flamenco music, particularly hand-clapping and dancing heels on a wooden floor, present on the title track. The music of the fore-mentioned track ‘Wristband” apparently finds its derivation in the sliding tones of a West African talking drum kit. Jon Parles writing in the NYT centres on the gospel voices – they just happen to be those of the legendary Golden Gate Quartet, pitch-shifted and slowed-down played forward and backward. This man keeps making superb albums and you just have to buy this remarkable set. Tracey Thorn, lead singer in Everything But The Girl, once fell in love with the voice and technical ability of American singer Patti Smith. She recalls the first Smith line she heard: ‘Jesus died for somebody’s sins, but not mine.” ‘Gloria’ is the song, the album: Horses. She writes of the visceral jolt of hearing them for the first time. The thought here, and elsewhere, in an absorbing and engaging book, is not about the lack of clothes, rather about the human voice when left alone, or as she puts it:” The moment when we first encounter the sound that comes from out of our body can be a profound and decisive one.” We travel the exploration of art, mechanics and spellbinding power of singing. It’s pages 202 and 203 where the clergy should pay particular attention. Choir man, Gareth Malone is instanced for simply getting sometimes reserved and doubtful singers to feel confident and worthy. She says that “for many people, singing is more fun to do than to listen to.” From there Tracey swims into the land of funerals and where so-called ordinary people sang, and they sang hymns. She notes traditional hymns have given way to other kinds of music and singing that seem to capture the mood.. At the service for her mum she requested ‘Every Time We Say Goodbye” from Ella, while for husband Ben’s sister it was the Carole King song “You’ve Got Friend’ as vocally interpreted by James Taylor.. She does not note a slight inconsistency in pushing the naked voice into second place behind the familiar record, but says hearing the recordings transports one back into memories. It can be agued surely that singing by a gathering in a way both unites those people in a way with the ‘loved one’ rather than the coldness of a manufactured system. However she does like communal singing, and indeed at the very outset of this book she extols the many variances of singing. Sill her final shout is a good one:” Sometimes, I sing just for the sake of it; because I can, and because I want to. In one of those moments I called Luke Thompson Luke Graham in Crisis 41. Luke has written a new much commended volume on the life and poetry of the blind and deaf Cornish poet Jack Clemo. He biography is entitled Clay Pheonix isbn 978-0-9934734-9-4. Over 600 pages and £15 in price. Reviews stress it is a compelling and superbly researched work – and this commendation is not printed here to make up for the mistake in name! It is a fascinating book. AS WE HAVE NOT HEARD FROM YOU SINCE 22 JULY 2009 WE THOUGHT WE’D SEND YOU A REMINDER OF HOW SWEET LIFE IS. SAVOUR SOME FREE WHITAKERS MILK CHOCOLATES! NORMALLY, WE ONLY GIVE THEM AWAY WITH ORDERS OVER £100. BUT FOR YOU THEY’RE ABSOLUTELY FREE ON ANY ORDER AT ALL! AS YOU HAVE NOT BORROWED A BOOK SINCE 8 FEBRUARY 2002 AND NOT RETURNED ONE TAKEN OUT ON JANUARY 23, 2001, AND NOW ATTRACTING A FINE OF £176, WE’D LIKE TO SEND YOU SOME FREE CHOCOLATES IF YOU WOULD COME AND BORROW A BOOK AND RETURN THE ONE THAT YOU TOOK AWAY IN 2002, WE STILL HAVE A WAITING LIST OF 23 FOR THAT SAID BOOK. Actually my placing such an event in 2002 is pretty mundane. You may have seen this past week a note in various papers that The New York’s Society Library, the only lender of books at the time of Washington’s presidency, has discovered that the president did not return two volumes. They were an essay on international affairs called Law of Nations and the Twelfth volume of a 14 volume collection of debates from the English house of Commons. They have launched an appeal for the return of the said texts and it is reckoned that at today’s prices, adjusted for inflation, Washington would face a fine of $200,000. So be not afraid to chase large debts. - YOU WILL FIND OUR LIBRARY SO DIFFERENT FROM THE ONE YOU ONCE KNEW. WE NOW ENCOURAGE LOTS OF TALK AND FUN. SILENCE IS NO LONGER GOLDEN. YOU CAN MAKE USE FOR VERY LITTLE MONEY ONE OF OUR COMPUTERS, WATCH A DVD, ROCK ON TO CURRENT MUSIC, SPLASH PAINT, TAKE YOUR PHOTOGRAPH, ADMIRE SOME ART, SIFT THROUGH SOME ANCIENT CDs, READ COMMUNITY NOTICES, SIMILE AT THE STAFF, AND COMING SOON FOR ALL FAITHS A PRAYER MACHINE. YOU NEED TO STATE HOW YOU FEEL AND WITHIN SECONDS A VOICE WILL SAY A PRAYER FOR YOU. YOU CAN EVEN ADJUST THE VOICE IF YOU WISH, MAKE IT SOUND HAPPY OR TIRED, LOVING OR ANNOYING. SHOULD YOU WANT A CHOIR TO EMBELLISH THINGS THAT IS ALSO POSSIBLE BUT YOU WILL HAVE TO WEAR A NOISE ABTEMENT COSTUME, and if Christian then you must hand your cross to the receptionist. AND WE CAN DIRECT YOU TO WHERE YOU WILL FIND SOME BOOKS AFTER A SHORT RECOGNITION COURSE. WELL, yes, I have gone from the actual to the imagined, not that the ‘imagined’ might not happen at some time. It probably does in America, somewhere. TO ANOTHER EXCITING moment in the Jasper life. Well, ‘exciting’ is a little over the top. Just the Monday ritual. On Monday, April 12, I turned to MEDIA in the Monday Guardian. There on page 8 was an advert. PUBLISHING CO-ORDINATOR. EXCELLENT BENEFITS. LAMDA. KNOWLEDGE OF THE BOOK PRINTING PROCESS, PRINT BUYING AND BOOK PUBLISHING. SO THERE IS LIFE OUT THERE. ALL IS NOT LOST. OVER at the Arts Council it seems they need inspirational people. They are appointing RELATIONSHIP MANAGERS – one of those startling new descriptions for the obvious. MOTIVATORS ORGANISERS EXPERTS PROBLEM-SOLVERS PRAGMATISTS, CREATIVE THINKERS VISIONARIES GENIUSES STRATEGISTS INNOVATORS ARTS FANATICS DREAMERS PERFECTIONISTS. Missing - HUMANS NEED NOT APPLY! Hopefully these RELATIONSHIP MANAGERS will be able to get on with people, can speak clearly, assemble thoughts well, know when to listen, can cope with silences, can withstand rejection – however. Hopefully, they will like authors, books, publishers, editors and indeed librarians. Hopefully to they handle a book with awe for surely there is in the shape of a book in its spine, binding, quality of paper, cover design, typography, illustration, something to draw in the breathe. THE WONDER OF THE BOOK. None of this is mentioned. Perhaps too much to ask, It would be pleasant to think a RELATIONSHIP MANAGER could sit and chat with you about a new book. More from the Guardian. Same issue. Same section. Copy focussing on uncertainty, division of purpose. For if the church seems frequently in flux, there’s plenty of upheaval all over the place, especially in communication of one sort or another. TRIALS AND TRIBULATIONS AT THE INDIE. THAT BEING A SUCCESSFU ACTOR WAS ABOUT STARRING IN AN AWARD WINNING FILM OR A HIT TV SHOW – BUT NOT ANY MORE. THESE DAYS IT’S ALL ABOUT THE BRAND. AND TO DIGRESS, A LITTLE, AND I DO THAT LOT AS YOU MUST ALREADY REALISE OR SOON WILL…..
TO A MAJOR PUBLISHER I SENT A SYNOPSIS. MY IDEA WAS TURNED DOWN BUT THE REJECTION LETTER DID NOT COME FROM AN EDITOR. IT CAME FROM MARKETING. WHEN I FIRST BEGAN MY JOURNEY INTO NOW SOME 70 OR SO BOOKS PUBLISHED I WAS CONSCIOUS THAT AN EDITOR OR EDITORIAL TEAM WOULD GO WITH OR NOT as was the case with AN IDEA, AND IF YES TO THE CONCEPT THEY WOULD WORK OUT HOW TO MAKE IT SUCCESSFUL I SUPPOSE IT DOES HAPPEN EVEN NOW BUT…. This time to page three. And there, congratulations to Holby City people as it reached its 500th edition. Continuing drama faces the noose. We are now into value for money scrutiny time. end its long life in August. When it comes to drama increasingly the word is ‘’co-production’ but then it’s also in the world of publishing. And I know that too well. And added to anything is the second demand that it is more palatable to an American audience – it is not easy to find favour for a book idea that is very British. How one longs to be sent a batch of letters that reveal how John Lennon shortly before his demise at the hands of a mad young person was intending to be a Baptist – that he had seen the light! That would make a co-edition and fly off your library shelves. Few things do not have side effects and if in the powerful world of television there is cutting and cutting then with it goes writers, and books that follow Also with it go areas that enabled people to learn and improve their scripting. I suggest that CONTINUING DRAMA is the nearest we have to the book – meaning that like the book there is an unfolding story, It cannot though replace the book that can be picked up, entered into, put aside, returned to, although yes, there are increasingly other ways to read than via book as we know it with a cover, binding, pages and so forth. And yes, we are entering into another big communication explosion. And I have the rather queasy feeling that if I were say 25 I would be coming to all of this in a different fashion, or at least I would be coming to things with a whole bag of ways to get people to read, let alone buy a book, or take a book away from the local library, or even church bookshelf. Would they still wish to see publishing houses exist? For to slightly repeat myself, I am a book addict, even if I use other means to communicate and tell some kind of story. I am starting from a love of books and I have a huge list of published works. Survivor reached number 2 in the best selling national chart listings while my book with Pat Doncaster Cliff settled in for a spell at eight and from all accounts should have been higher, at least on sales, and Sidgwick were disappointed. Some people express worry that the idea of discovering and finding will diminish – the sense of being on a journey, of building something, of finding the new and unexpected, all part of human development. All so vital. But I realise at this point that I am defending to the death the book, and maybe have been a little careless not to be more concerned with the process of importance of learning. And so rejoicing in whatever form that happens. Though, there are voices saying the new ways of reading and relating threaten the book, and that we have new generations for whom everything has to be packaged quickly and of meagre duration. Lots of pics and little writing! Actually it’s hardly new for what are the tabloids but that…whether you read or like them, papers such as The Mirror or the Sun display skill to pare down thoughts, to write headlines with a limited number of letter spaces, all of course with the risk of simplicity and reducing the complex to some ill-funded quickies. Did we not see this in the tabloid front pages before the second television confrontation with the leaders of the three main parties? Fortunately to my way of thinking some broadsheets remain, but one reason for the tabloid size gaining popularity a la Times and Independent rested in how you can open and comfortably read without say getting the pages in the face of the person opposite you in a train or bus or tube. It meant – supposedly – that you could turn pages much more easily. Unfortunately too often interior sections are not wedded to the rest and they fall out. You collect them amidst the feet of the many standing travellers! Some of these factors eat into everything, even into Christian worship, although we should be careful in thinking all this is totally new. I mean simply the process and the eventual employed method, of trying to make something palatable, can replace the reason why these communicatory forms were established. The striving for relevance or understanding dominates many an agenda. So to within that the ‘quickie’ – the ‘watered down’ – in church terms I feel that although some of this may have a point, and conceivably does bring a few in, it also shows the door to a good many other people who resent the dumbing down process. Not so long ago there were, no, there still are in some places, shopper services. Good morning and welcome to today’s service, sponsored by Tesco. Allied to a news flash that Tesco has not only opened during 2011 800 new stores, it has purchased 7,000 church sites for a further 7,000 stores by 2012. I’m pleased to say that several parishioners have come into millions by copying down the hymn numbers of two week’s ago and entered them in the Lottery. To aid church funds we are asking for any of you to lay claim to copyright of the weekly numbers. So at this point, I guess to say that an underlying aspect to all that I have said – somewhere along the line anyway, is the word CHANGE. I was brought up to read. I could read fluently well before double figures in age. Thanks to my beloved mum I can read extremely fast and journalistic training has enabled me to see the essential and go beyond the padding. I may not be a good editor of myself – that I will leave to your evaluation but then in a speech that can last up to an hour some padding is surely respectable and expected. To come at you with sparse sentences, with endless points, would I think be a little too much. As a child I visited the Penzance library. It’s still there but as my slight tongue-in-cheek early description, quite different in 2010. Well, yes, in times past there was a degree of foreboding. The silence. Just the sound of shoes walking on the wooden floor, and books removed and replaced from shelves, or of books date-stamped. Yet at the same time you knew it was the place of learning, secrets for the revealing, and there was a push toward good writing, suggestion of material to stretch the imagination and mind, and in my case a little frown to make me uneasy when I enquired about an Enid Blyton book – the ‘Mystery’ series or the ‘Fives.’ I did read Just William Teddy Lester, Biggles and so on – later in love with Alexandrian Quartet, Dickens…..
And so I could continue. I should say that I have built up a considerable library of my own on both religious and music subjects, and in magazines. Am I being romantic in saying that I would like to think that as an individual hits the library confines, it is to walk into the magic o the book and print - something so special. I might as well get into a moan here. I offered or have offered at times some of my books to the library back home and been turned down politely – not for their substance, be they Christian or general, simply because of the computerised and ordering system. Perhaps they are too pedantic, maybe not. They were friendly. Change yes is always a plus factor but not if CHANGE comes for ill-thought and ultimately harmful reasons - so if you like you can make a library exciting but it ceases to be of real value and of only short-term life if it is nothing more than a kind-of Macdonalds. There is always the temptation to take the easy way into interesting people in whatever it is you are offering and in the process of forgetting what it was you had in mind anyway. Contemporary Christian expression is full of this. There is panic in some religious quarters as statistics are brought forward to talk of impending death to say the Methodist church. So people think of schemes and ideas to redress the situation, but often these are little more than knee-jerk responses, and so someone can report back or whatever and say matters are being addressed. And when it comes to religious books I have the feeling that in some cases and in some publishers that the design team, the illustration people, are having a ball, but the actual material and ideas have not be rigorously examined and that the sub-standard is getting by – or at very least the writer, the editor. The designer are not working together. Something doesn’t seem right anyway. My theatre Company goes to many churches and ofyen there is a bookstall of sorts, but it would seem the turnover is small, sometimes because the person responsible is on a mission – to only stock what they think is right and proper. I observe my cast, just a cursory look, little interests other than some cards and bits of jewellery with Christian symbol. Modern Art and the Death of a Culture. It came out in my text as Modern Art and the Death Of A Vulture. Actually it was a useful error since it picked up notice in a number of publications including The Observer. The author suffers from bad editing. It is a pity to see the word ‘ghettoize’ spelt with an ‘s’ rather than a ‘z’. Although 234.567 words were spelt correctly this error quite took my attention away from the doubtless serious subject being raised by the author. I don’t know how much you are affected by a review when thinking what shall be bought for he library. To think that years ago well stocked libraries would aid many a hardback publishing run and now, not really. If it doesn’t seem too arrogant as a writer – but then I do buy books – and as a Christian seeking greater understanding of faith and the Scriptures I do feel there is a lot of dross being published. I feel that much of religious publishing, certainly of a more evangelical nature, has the feel of a basic insecurity – the frenetic desire to get something across. Yes, indeed, religious publishing has its own marketing and selling problems – as for instance in the collapse of STL, the closing of Wesley Owen shops, affecting places of possible sale. Fortunately some of the stores have found new owners. It is not good to see the decline of religious publishing outlets, and as a Methodist, I am more conscious of this than many. Once a mighty force, the publishing and selling aspect of printed material from Methodism is now not much more than a small squeaking mouse. It is one of a number of retreats by that Church and which will hasten its demise unless it drastically changes its present foolhardy programme. But the overall religious world with product to sell is no different in essence than any other. Although it maybe likes to think it is, and so can shrouds things with a religious layer. In the end when all the religious verbiage is removed it is about keeping a business going, it is providing employment, but its often low payment to writers and production free-lancers does not speak well for the eventual ability to attract the best people. A read of the readable and well put together magazine CHRISTIAN MARKET PLACE with its sub-title of re-sourcing RETAILERS and SUPPLIERS in the end comes across in no different fashion than say The Bookseller. 0k, I generalise, people do set up bookshops and outlets with more than money as paramount in their motive. They do want to feed the flock. They do want to see converts. Too many though have a narrow take of title. It is also disquieting to see American material absorbing more of the market, not that I am criticising as such religious product from across the Atlantic. Obviously many very good books on religious topics emanate from there. It is simply that every country needs its own writers, its adventurous publishing lists, its encouragement from publishing houses. Words need to be addressing our situation that is often markedly different from across the waters. These are important elements in the overall religious mix of sustaining in faith the religious community and at the same time producing material for those who seek faith and wish to see its relevance on personal and community levels. Closure of shops and retail outlets could drive people back to the libraries. Good news! But then how much money do you have? your library has to purchase new books and how many of these can be religious? That does not obviate the simple fact that if you are to stock religious material from your limited purchasing power you have to assure yourself that there is good material ‘out there’ to fill a religious shelf, and I am sure, that there is pressure these days to spend resources on other faiths than the one to which we all subscribe. I’m not sure how, but in a way the religious world like any other has its moments and of needs it looks for the different, something to revive and change the existing scene.. Am I being vague? Well, my example would be the enthusiasm and far seeing of the Alexanders who brought us Lion, and something new and appealing. They proclaimed in their publishing list that religious books could be visually excellent, texts could be stirring. And how Lion shifted books! I must be careful not to give a total impression that all elsewhere was drab and boring. Houses, for many of these have gone to the wall – perhaps I was instrumental? What does seem to have gone is the editor’s lunch which was the editor’s perk and to which you the author, were told, that in no uncertain terms, was a mandatory happening – if you wanted a contract. Editors seemed to have been much more quirky years back, maybe they could be more relaxed. Sometimes you had to go trough a form of torture to gain the contact. I loved Priscilla Collins, a ormiable far-seeing and exciting person and then Collins were in St James’ Street in a lovely falling apart building that seemed to go with publishing houses. She had a pecanse dog. It would attack your ankles. You had a difficult but at least clear choice – kick the dog and be asked to leave or sruffer and gain a contract. There were uirks in other fields. I came into contact with a redoubtable BBC lady Peggy Bacon, the first producer of Children’s Hour. When I met her it was for Fourth Dimension, an up-to-date version. To gain entry into her small team of writers and broadcasters you met and talked things over. The sign to your acceptance was known as Peg’s Bag. Should she produce this, you knew you were ‘in’ the Peg’s broadcasting family. The battered bag would contain a wee dram if I recall it may have been wine, and the only negative, some rather wilting smelly cheese. One of my books THE ILLUSTRATED FAMILY HYMN BOOK is still borrowed greatly from libraries, although I cannot but believe the covers must be hanging off. I have attempted to see a similar one published but in-spite of hefty PLR returns on that, and to a a degree on two others of kind, THE ILLUSRATED FAMILY PRAYER BOOK and REJOICE, have met disinterest. I do confess that at times I have not the slightest idea what publishers want and when. I peruse through what is being published. I am sometimes even more mystified. Logic doesn’t always come into it, as I recall with one title of mine that sold really well. I suggested an up-date but they thought it wouldn’t sell more than 8,000 hardbacks whereas another book by someone else would sell say 2.000 copies full stop. The latter was a safe bet, the publishing programme could be put into effect but mine, brooked uncertainty. I’m still trying to work that one out! Of course you can sell a complete print run, as with the last and other editions of my BRITISH RECORD. CHARTS that sank because WH Smith decided they didn’t want a future edition because maybe their sales figure was not what they wanted, but it was enough to say goodbye to a series of books. The sell-out run was 10,000 – of which Smiths had taken a significant quantity. I suppose in recent religious book retail terms the pace has been set by Faith Mission. And then there is Ken Monroe who is at the head of the expanding John Ritche ltd. However I must needs not run too much into what may be said by Edde 0liffe later today. Other than to say the small shop needs to build relationships with customers, exercise tight management and know how to display. Other than to say that I hope the shops that arise from the demise of Wesley Owen will not be so mogue-like: you know where the music output and wattage is like that of a crematorium, just hearable and irritating for being that way, and no one speaks much, customers tip-toing around, the staff almost whispering..and you want to yell, cause a disturbance, knock over a pile of books, and you leave feeling bad that you did not do any of those things. Wesley Owen when in London had as it were two shops in Wigmore street, both well stocked. One was much more trendy, and had the music section, With some interesting mags and other product, even there though it was still so reserved, so unlike Greenbelt-ish. There seemed to be trendy shoppers and maybe that was seen with some fear. It’s another inexplicable item on my list of inexplicables. AUTHOR MINEFIELD: PUBLISHER WANTS, PEOPLE WANTS, LIBRARIAN WANTS. I had to give a title, and it was how I felt at the time. I’m not sure if I feel an different. Certainly I have continual ideas on what I wish to write – short of having the money to self-publish I am at the mercy of ‘the’ publisher and naturally I do hope you will say Tony Jasper – ah, yes, stock him. Very nice of you. Thank you. I will be visiting to see that this is so. Well, I more-or-less ceased writing books in 1992. I began writing plays and putting my acting experience into tangible focus .From then until 2009, just two books, one with Pauline Webb, published by OUP, entitled WORSHIP IN EVERY EVENT. It didn’t sell in the way they expected. The book contained a series of talks and prayers, litanies and memories, and scripture references and filed under subjects. It was intended to provide material for youth workers, worship leaders, the clergy…but material to meet the special – so for instance, in your church a young person dies from a drug overdose. You are the pastor, what do you do? What do you say? Ah, here comes WORSHIP IN EVERY EVENT that will give you some words to say, prayers to pray, scripture to be read, some reflection and material for meditation. MY SECOND is NEXT WE SHALL SING that was published by HIGHLAND and which fetched amazing reviews across the religious press but sales have been nothing special. That is always driven home by the royalty statement. The book was the Jasper rampage through different elements of hymnody and praise songs, gospel, and folk, even jazz. I have a few with me and I am prepared to sell them! ONE TO COME THIS YEAR, in November, at presently titled JESUS CENTRE STAGE..co-written with the authoritive co-authorship of Ken Pickering whose work on drama in general, and religious drama is second to none. Publisher: Highland. This text traces the person of Jesus as seen in religious and secular works, from the mystery plays to Withenshaw, to the big street showcases, Superstar and Godspell, Come Together and Hair, and yes, put the book on your list. Ken does the classic and traditional and I enter with the Dorothy Sayers epic The Man Born to be King but suggest strongly that ANDREW Lloyd Webber and Tim rice were to change many things with Superstar, and which for them helped to bring Joseph into major prominence. Getting lost is my gathering together of spirituals, blues, folk and gospel, songs of faith in one volume, rather than items spread across umpteen books, but no interest in publisher land. This to some 600 pages so far, as I have chronicled the alternative Christian happenings since the 1950s, from the Graham campaign of 1954, the first to use media and modern selling methods to Greenbelt 2009, back to Buzz, A Man Dies, Jesus People, His paper, Mr J Cash, first Jesus Music, Reflection, Judy Mackenzie, pop hitss and religious songs, and lots and lots more – is there a publisher in the house? There are books out there about mainstream churches, their politics, relationship to the State, the church in parliament – these and others doubtless important but in many senses so what! Isn’t all that I have mentioned, among many other events and happenings, worth recording? AS I reached this point I felt I was tiring, a sign that I ought to stop, and giving this now, the same feeling. But a PS “ we are allowed by His good grace to live in an exciting time, even if in some ways I would yearn for several decades or so back when religious publishing had a vim and energy, but all the time new ways keeps crowding in upon us. 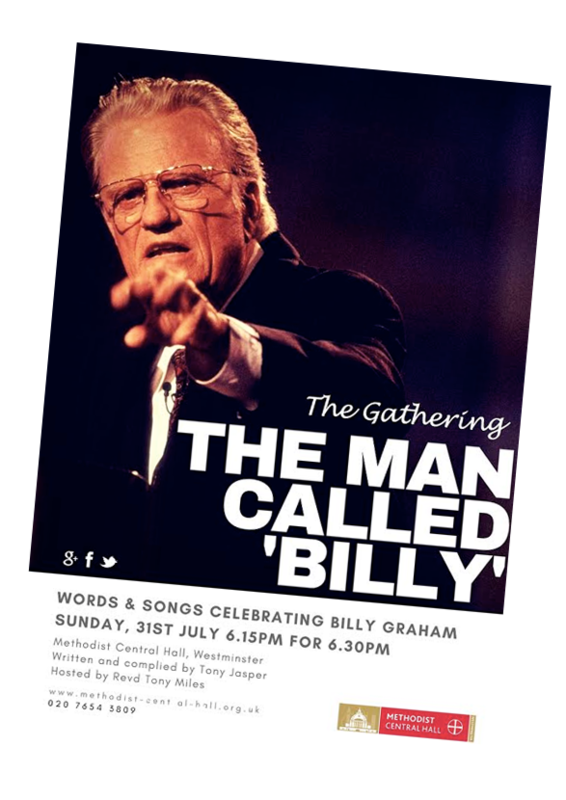 July 31 6 for 6.30 p.m.
Tony jasper’s new music-docu on the greatest evangelist of the 20th century with Ruth James, Tony Miles, Choir and more. FREE! Tube: Westminster. St James’ Park. Lots of buses to Parliament Square.